8079 pharmaceutical packaging aluminum foil is main used as the blister packaging of medicine capsules and tablets, as well as bag packaging of powder granules and water. 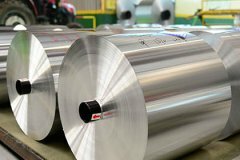 Due to its direct contact with medicine, the requirements on the appearance and performance requirements of the pharmaceutical grade aluminum foil are strict. The common pharmaceutical packaging aluminum foil on the market has a thickness of less than 0.05 mm. Fourth, in the annealing process, according to the performance requirements of the pharmaceutical packaging aluminum foil to control the annealing time and annealing temperature to ensure clean oil. With the development of the pharmaceutical industry, 8079 pharmaceutical packaging aluminum foil have excellent moisture resistance, barrier properties, chemical resistance, chemical stability, hygiene, application ratios, and appearance and quality requirements are increasing.